The Leitz microscope traces its lineage to a company founded in 1849 in Wetzlar, Germany, the Optical Institute. While telescopes were the original focus of the business, microscopes soon became the primary product. Ernst Leitz was hired as an engineer 1865 and was running the company by 1869 when he reorganized it as the Optical Institute of Ernst Leitz. In the first 20 years the company produced 15,000 microscopes. By the end of the first decade of the 20th century, Leitz had expanded its product line to include film projectors for the nascent movie industry and binoculars. Polarizing Leitz microscopes were introduced in 1885. Leitz was a wellspring of innovation and started producing microscopes with hollow frames, built-in illumination sources to replace reflector mirrors, and pioneered phase contrast, dark field imaging, and camera mounts and cameras specifically for photomicrography. The company was at the forefront of polarized light microscopy with one of its engineers, Dr. Max Berek, discovering how to mathematically compute the depth of field in microscope imagery. Through the years, Leitz microscopes have continued to evolve as cameras and other products have assumed greater prominence in its product mix. The 1950’s and 1960’s were earmarked by competition with Zeiss microscopes, with each company trying to best the other. Then in the 1970’s, competition with Japanese companies such as Olympus and Nikon shrank market share and profitability. Ownership of Leitz changed hands over the 1970’s and 1980’s and for several years operated as Wild Leitz Holding AG. This company merged with the Cambridge Instrument Company in 1990 and was reborn as the Leica Holding B.V. Leica is now the brand name for what used to be known as Leitz microscopes. 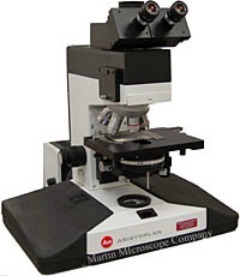 Leitz microscopes are known for their high quality and durability. The venerable Orthoplan was the premier model manufactured from 1966-1991. The Orthoplan was produced without significant design changes for 25 years. This modular system can be used for all types of microscopy with the addition of the proper accessory package and is still in use in many research facilities. The first widefield microscope, its field of view was 28mm which more than doubled the viewing field of existing microscopes. Manufactured in black, hammer-tone gray, silver gray, and ivory, the first black units are rare and considered to be quite collectable. A rather large microscope weighing 44 lbs in its pristine state, when accessorized for some viewing methods it weighs upwards of 60 lbs. All of these variations can be accomplished by replacing a standard microscope component with a specialized condenser, body tube, illumination source, or nosepiece. The many different types of interchangeable components for this Leitz microscope allows customization of virtually every segment of the unit. Three different 170mm body tubes were made for this unit along with seven different nosepieces and 14 condensers. Each of the four different types of lamphouses can accept mercury, xenon, or halogen bulbs. The color corrected objectives vary in magnification from 4X to 100X. Leitz microscopes are designed for precision in every aspect of their usage. All moving parts on the Orthoplan were engineered with ball bearings. In the case of the fine focus adjustment mechanism, planetary gears allow for a precision of movement resulting in one division of adjustment equal to one micrometer of stage displacement for an accuracy of 0.001mm of movement. Even with the improvements and minor changes of the Orthoplan over the years, all of the models components are interchangeable with every other Orthoplan. This Leitz microscope was designed to be an effective tool for decades. The successor to the Orthoplan as top of the line of Leitz microscopes, this model was released in 1986. Many attributes of the Orthoplan were incorporated in the Aristoplan and it may also be used for a full range of imaging techniques including phase contrast and differential phase contrast, fluorescence and darkfield. 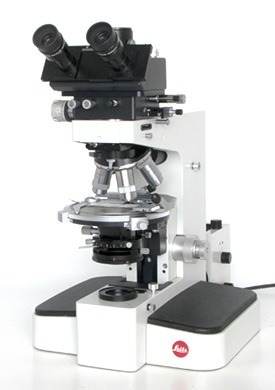 A top of the line research grade Leitz microscope, the size is approximately the same and many components are interchangeable with the Orthoplan. Rather than offering it as an optional accessory kit, this model has a built-in epi-illumination system which uses standard Leitz filters inserted into the body tube. As with the Orthoplan, the Aristoplan will accept mercury, xenon-arc and tungsten-halogen bulbs in a lamphouse designed for fluorescence microscopy. However, the Aristoplan’s condenser has an apochromatically corrected lens and can be adapted for various imaging methods including darkfield and oil immersion by using different condenser tops. The tube length of this model is 160mm and the eyepieces are specifically designed for this length rather than the greater length of the Orthoplan. The color coded objective lenses have various magnifications ranging from 2.5X to 100X and are designed for a 160mm tube. A magnification of 16X and up may used interchangeably on an Orthoplan scope but, because of its 170mm tube, lower objective magnifications will not image well. Fine and coarse focus knobs are located on either side of the stand; however, the precision of movement is less than its predecessor with each division of adjustment equal to 2 micrometers of displacement. The mechanical stage may be rotated 90 degrees but the full range of movement is only achievable if the specimen is centered on the slide. Verviers allow the precise placement of a specimen along the x and y axis. Also designed for widefield viewing, this model can utilize binocular and trinocular heads and a beam splitter allows the viewer to allocate discrete portions of transmitted light between the phototube and eyepieces. 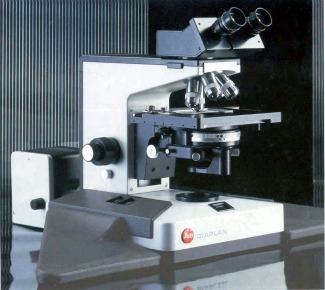 A general use microscope, the Diaplan hit the market in 1985 and also adheres to Leitz’s system of modular design. A distinguishing feature of this model is that a field iris and an aperture or condenser iris are both located in the base of the microscope. A dubious feature of slight benefit, this was the first microscope to incorporate this design feature. A distinguishing feature of this model is that a field iris and an aperture or condenser iris are both located in the base of the microscope. A dubious feature of slight benefit, this was the first microscope to incorporate this design feature. The standard lamphouse for the Diaplan is interchangeable with the Aristoplan and has a focusing control for the field lens. It will accept mercury and halogen bulbs and can easily be adapted to epi-fluorescence microscopy. This scope has the same universal condenser as the Aristoplan and can be adapted for the various types of viewing methods and techniques including fluorescence. Employing the same mechanical stage as its predecessor, this model also has a similar focusing control, but additionally the Diaplan has stops that can be set for coarse and fine focus. This model has a beam splitter, photo port, and binocular head with a 30 degree viewing angle. Largefield eyepieces can provide a field of view of up to 25mm. As with the Aristoplan, any Leitz objective may be used on this scope as long as it is designed for a 160mm tube length. The color coded objectives range up to 100X magnification with a special objective for oil immersion. Standard Leitz filter blocks may be used with the Diaplan and 2 epi-illuminators are also available; one holds one filter block and the other is able to accommodate three standard filter blocks. Leitz microscopes and some brand components can also be purchased online at Amazon. Durable and well-engineered, the Leitz microscope obtains versatility from its modular design. Microscope systems, they may be retrofitted with a variety of components to utilize all major methods and techniques of brightfield, darkfield, and fluorescence microscopy.